Laser- Guided Land Shark. Card Artwork. Monster Type: The Deadliest Predator of the Sea... WEAPONIZED!!! While the Land Shark is fun to laugh at, unless you become an amputee, the Laser-Guided Land Shark is a terror of epic proportions. What was once helplessly flopping on the ground, the Laser Guided Land Shark is weaponized by Dark Magics by giving them propulsion and a magic sight that targets any poor adventuring party. What deviltry this is, and what demonic entity allowed for such a being to exist? I ask, nay, I tell thee; BEWARE OF THE FLYING SHARK!!! 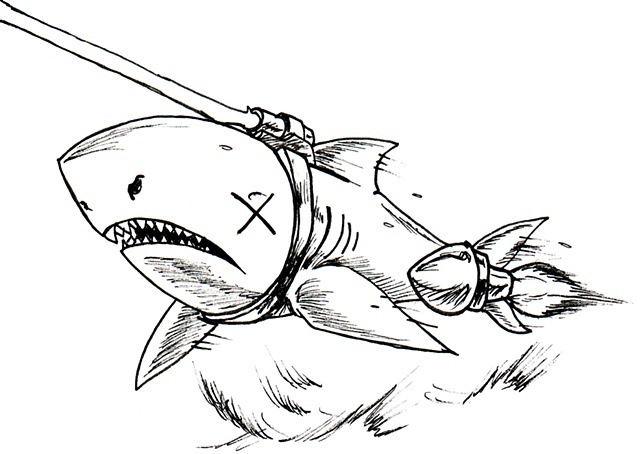 The Laser Guided Land Shark was my spin- off of the Land Shark, in that I gave it the Dr. Evil School of Evil Ideas in giving sharks rockets and a laser sight, making them the cruise missiles of the fantasy genre.